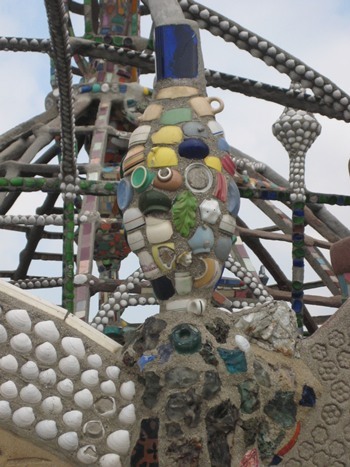 The iconic view of the Watts Towers shows the massive spirals silhouetted against the sky, emphasizing the magnitude of Simon Rodia’s artistic and engineering marvel. What’s missing from this image, however, is the exuberant color of Rodia’s mosaics, which line the walls, archways, and even the towers themselves. Many of the fragments that make up these vibrant designs come from local pottery manufacturers, whose solid-color dinnerware inspired a national craze in the 1930s. The trend started in Southern California, where companies like Brayton Laguna and Catalina Pottery began producing vivid colored earthenware in late 1920s and early 1930s. Larger companies, such as J. 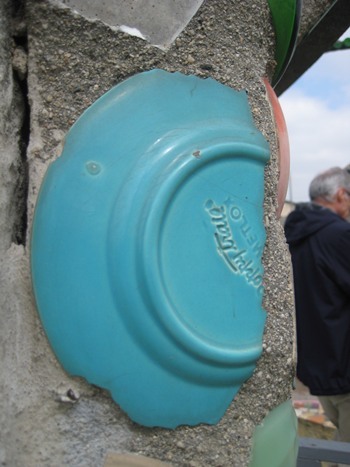 A. Bauer Pottery Company, Vernon Kilns, Metlox Manufacturing Company, Gladding, McBean & Company, and Pacific Clay Products began to produce their own versions, marketing them across the country. Brand names like Metlox’s Poppytrail (visible in the plate above) and Gladding’s Franciscan traded on romantic images of California’s beauty. Their success spurred Eastern and Midwestern potteries to launch imitations—most famously the Fiesta line, introduced by West Virginia’s Homer Laughlin China Company in 1936. The California Pottery Guild, founded as a joint advertising venture by the five major Los Angeles-area producers, worked to remind retailers that the fashion for “California color” had originated in the Golden State. 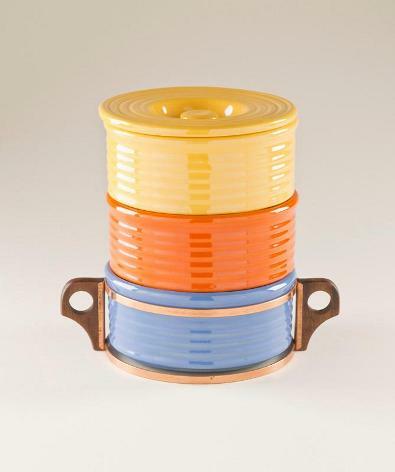 The heyday of California pottery overlaps with Rodia’s construction of the towers (1921–1955), so it’s no surprise that fragments of the characteristic colors and deco-style lines of their products, which would have been inexpensive and plentiful, pop up so frequently in his work. The bright ridges in the archway above may very well have come from a set of Bauer stacking dishes, like this example from LACMA’s collection. While the towers as a whole demonstrate the powerful vision of one man, the individual pieces give us a glimpse of the material world that surrounded him. 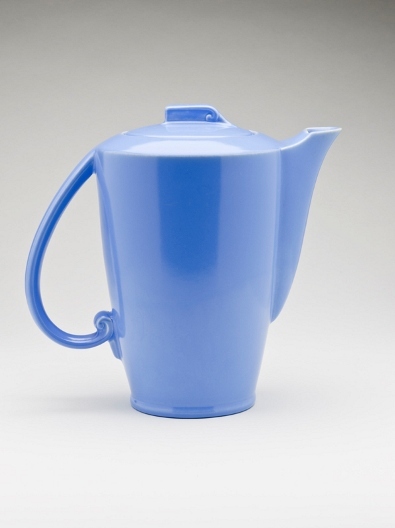 The exhibition California Design, 1935–1960: “Living in a Modern Way,” which opens in October, will take a broader look at this world, including the designers behind the colorful pottery that was so appealing to Rodia and his contemporaries. This entry was posted on Monday, June 6th, 2011 at 7:38 am and is filed under Uncategorized. You can follow any responses to this entry through the RSS 2.0 feed. You can leave a response, or trackback from your own site. 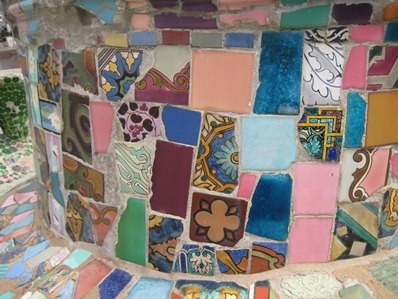 Simon Rodia also worked for the Malibu Potteries company, and apparently would come home with his pockets stuffed full of Malibu Tile fragments. Thanks Steven- We wrote the definitive book on Watts Towers after many years study. Interviews with Malibu Tile experts who checked company employant records show that Rodia NEVER worked for Malibu Tile Company! They went with me on a careful search of the Rodia sculptures and only found ONE piece of a broken tile that came from the Malibu tile pottery! He probablu found it along the Red Car or Santa Fe tracks by his Watts home! We show the Malibu shard in our 1997 book published by Getty Museum, the Los Angeles Watts Towers. 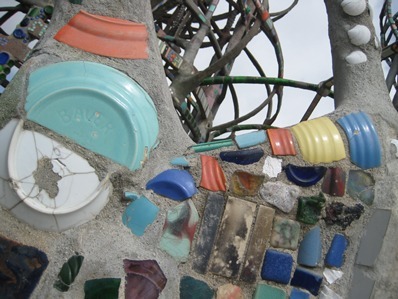 Actual manufacturers of Watts Towers pieces is shown in the book. 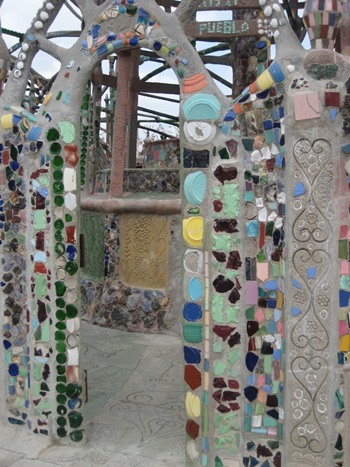 i feel silly but i didn’t realize the connection between watts towers and california pottery. rad. That’s interesting, I saw that in the little museum at the Adamson House in Malibu. But these legends take on a life of their own. I’ve never heard of the Watts towers, but it is definitely inspiring to see a man work with no modern tools, and dedicate everyday to the construction of his vision. So often I hear of sculptors simply having a large idea or concept for a sculpture and hiring fifty men to put it together. Here is a man who did this labor on his own, using his own two hands, out of sheer passion and vision. I love this concept, it is exquisitely and quietly inspiring. I was looking for a museum experience for my upcoming birthday. 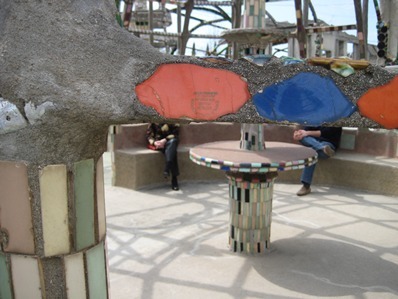 The watts towers have been on my list to experience for 10 years….after doing some cursiory research I think I would enjoy the watts towers more if I knew more of the history first. So i went on amazon.com and bought the “I build the tower” dvd….and will wait to visit until I have viewed this to really get the most out of the experience. I recall being told that children enjoyed being around this magical lil’ Italian gentleman. They would bring him broken dishes and bottles they found. There is even some speculation they might have purposely broken some of their Mother’s dishes as an excuse to take more pieces to the artist to add to his whimsy. I LOVE THESE TOWERS — only saw the place once but it was VERY memorable. I am also grateful there is so much attention being shown towards the preservation of the place. Hopefully it will be allowed to grace the sky for decades into the future! Please, keep up the good work and the detiled study. It is greatly appreciated – even in far away Arkansas.